Place Of Creation : Adelaide,S.Aust. The South Australian: a weekly journal of news, politics, sports, literature, arts and general information, was the first of several newspapers founded by the notorious Ebenezer Ward. In its first issue, Ward described the newspaper as 'independent'. His main aim was to provide a vehicle for his political views, particularly in relation to the highly topical and vexed question of land reform. He ambitiously hoped that the South Australian might become an opposition newspaper to Adelaide's existing weeklies - the Observer and the Chronicle. The newspaper also provided lengthy sporting news - mainly covering horse racing, including local, interstate and overseas races. In 1868 the South Australian Parliament was gripped by the 'land crisis'. Wakefield's theory of colonisation had been implemented in South Australia, financed by the proceeds from land sales. Land was sold at auction, with all sales being strictly on cash terms. This system naturally favoured those with capital. It was also notoriously open to abuse. However, despite the difficulties faced by small farmers in South Australia, it was not until the availability of cheap land in Victoria saw farmers leave the colony that action was taken in the South Australian Parliament. The Waste Lands Amendment Act (or 'Strangways' Act') saw the defining of 'agricultural areas' - areas where ordinary farmers would not be faced with unfair competition from wealthy investors. The Act also allowed for payment of a deposit at the time of purchase, with the balance payable four years later. Although much of this reform was in general keeping with Ward's views, he felt the Act did not go far enough. In 1870 Ward was elected to Parliament and was then able to put some of his views into action. Ward was secretary of the Royal Agricultural and Horticultural Society of South Australia and the pages of the South Australian contained many articles dealing with horticulture. From May 1869 a series of articles by EB Heyne, the nursery proprietor, addressed the subject of trees suitable for planting in Adelaide's public spaces. Ward had previously been the theatre critic for the Melbourne Herald and the South Australian also contained a regular 'Drama' column. There was also a column titled 'Gleanings for ladies', a mining column and a serial story. However, horse racing took up more space than any other single topic. The South Australian was originally a tabloid sized newspaper of 12 pages, sold at four pence per issue. 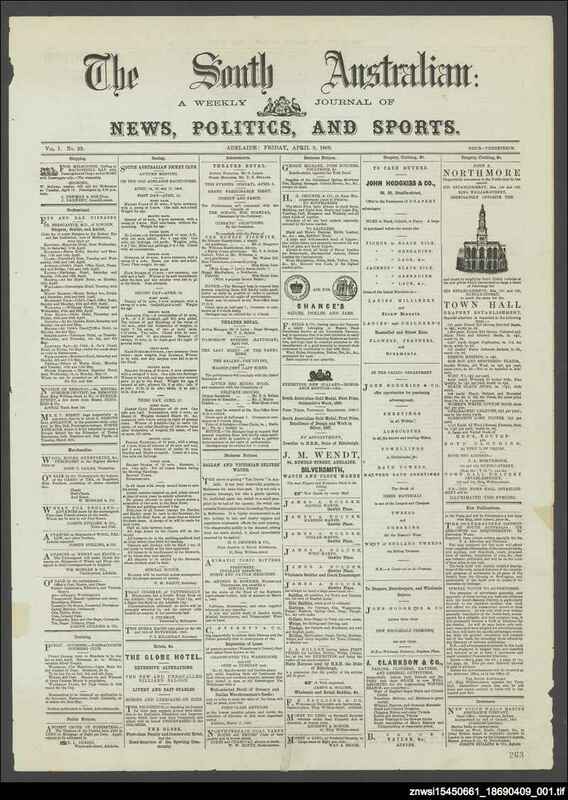 From 9 April 1869 it was changed to broadsheet and four pages at three pence. The last issue appeared on Christmas Day 1869, but gave no notice that it was to cease. A few months later Ward began a new newspaper, the Gumeracha guardian and north eastern advertiser. The new title clearly used the same printing facilities and the same advertisers used its columns. It also, again, strongly urged land reform.